What follows is a partial translation of a presentation made by the architect and greek activist Stavros Stavrides in CSO Patio Marvillas of Madrid, the transcription of which done by Eva García y Beatriz García of the Observatorio Metropolitano de Madrid and was published in Periódico Diagonal. (06/06/2013) A video of Stavrides' presentation is available on line (Contested Cities Madrid Stavros Stavrides), though what follows is not a transcription and any discrepancies between the translation and the actual communication should be understood as a consequence of the betrayal of translation. The question period that follows Stavrides’ presentation has not been translated, nor was it filmed, but it can be consulted in the original Spanish translation in Periódico Diagonal. In our times of rebellion, the value of Stavrides’ intervention here is to be found in his analyses of the commons and the experiences of urban self-management in Greece, after the model of the occupation of Syntagma square. And what Stavrides speaks of can be extended to spain’s 15M, and to perhaps more ephemeral experiences in egypt, the united states and now turkey. “The occupation of the square in Syntagma was not simply a collective form of protesting nor of making demands. Beyond that, it was a way of reclaiming our very lives and of proposing a distinct way of organizing social life”. The architect and professor at the National Technical University of Athens Stavros Stavrides visited Madrid to give a series of takes about anti-austerity movements in Greece, from the perspective of the processes of creating and self-managing of medical services, squares, popular kitchens, markets, or social centres by the population. “The experiences lived in Europe (including Madrid) are very much tied to claims for a new type of democracy and the construction of our very lives,” Stavrides assured in his talk the Madrid social centre Patio Maravillas, from which we reproduce a transcription, followed by a question period. This period has created a new way to produce political subjects. They are not simply subjects of actions and demands, but of proposition and creation. These so called subjects, who were not even conscious of being so, have created new forms of self-organisation and self-help in the midst of a very grave economic and political crisis. The first characteristic of the movements and initiatives that emerged from Syntagma square was their link with self-management. In this period of Crisis in Greece, in Athens, we confront a series of grave problems that have to do with day to day survival. New actors have appeared who try to help those most in need, such as NGOs and philanthropic associations. These types of initiatives reproduce forms of power: patronage and direct power. On the other hand, we have the legacy of Syntagma which are initiatives that also seek to address needs but which also have to do with participation and co-involvement in this assistance. An example: a social centre was created in the centre of Athens, in Zografu. In the area, the city government of Athens also had a centre which offered daily meals to people without shelter. With the crisis, the government no longer had money to maintain it and the centre and its activities were abandoned. People on assistance at that moment sought out the social centre. It was created on municipal property in a small cafeteria that was occupied to create a social and cultural centre in the same neighbourhood, in the spirit of Syntagma. The people of the social centre told the homeless that they could not help them unless they themselves participated in the actions that helped, both themselves and others: “in the case of knowing how to cook, to work with the cooking group to cook for you and the others”. It is a small example of the spirit of Syntagma, where self-organisation and self-help (mutual aid) are emphasised through collaborative projects. These political subjects are not susceptible to being classified in the same way that they were before Syntagma. Following the idea of Jacques Rancière, political action is basically an action that declassifies subjects. I believe that those involved in initiatives re-invent themselves socially and politically in these actions. For example, there are a great many medical centres in the city of Athens where the professionals involved develop a medical activity, but where they are not reproducing the traditional role of the doctor because they are constantly reinventing the relationship with the patient. The aid that is here exchanged is of a neutral nature, neither related to the market and the gaining of profit, nor in the majority of cases publicly supported; they are based exclusively on solidarity. All of these experiences developed under the umbrella of Syntagma have to do with democracy in a very particular way. After Syntagma, and undoubtedly also in relationship to the experiences lived in Madrid, democracy did not only signify a way of participation and of the taking of decisions. After Syntagma democracy was transformed into a problem of creation, coordination and practice. The meaning of democracy changed in Syntagma, it was re-invented because people met each other, as equals, and they had to act in a coordinated manner even in the absence of any centre. We can say that these initiatives had as a common characteristic the use of democracy as a way of coordination and creation through collective endeavours. Democracy in other words is sharing between equals in circumstances where this equality is democracy’s precondition. During and after Syntagma, the idea of a vanguard was put to the test. It is not a coincidence that both the most Stalinist element of the Communist Party as well as the most combative of the anarchists opposed the process-experience of Syntagma, in the name of the struggle against the bourgeoisie. By contrast, Syntagma demonstrated that if all were to be considered equals, then everyone had the capacity to participate in a collective process. I believe that the spirit of Syntagma, its legacy, can be seen in those initiatives in which in no part of the movement doe s a leader appear. These experiences based on horizontality have more successfully connected with people than those others based on the idea of a vanguard. These initiatives in the spirit of Syntagma that try to stem the effects of the crisis are not only characterised by a kind of procedure by also by a type of product. If we can agree that products are produced through social relations, and by products understand both physical, tangible goods, as well as services and social relations, we can arrive at the conclusion that new products emerged from these new forms of collaboration, that is, common goods that produced through a making in common, a commoning. For example, there are numerous collective/popular kitchens in the city, some connected to anarchist or leftist collectives, others to neighbourhood associations, but in none of them is only food produced, but also new forms of collaboration, relations and habits that produce in people a new understanding of the circumstances in which they live. The same holds for the exchange networks developed throughout the country, where people can exchange goods and services without money. In ways similar to what happened in Argentina and other cases, we know that in crises, that people develop networks by means of which they can find what they need or exchange without the necessity to have money. In this case, it is not the market that establishes the prices of things, but rather a social reevaluation of the value of products and services is produced. Another example are work collectives, in which it is understand that the problem of work, in the context of high unemployment, is no longer an individual but a collective problem. There are numerous examples of small cafés and shops managed by collectives, without bosses, where it is the workers themselves who share the profits and evaluate the services rendered on the bases of different criteria of evaluation. We have other significant examples of old companies that were abandoned and the workers recuperated them. The first is the medium industry of construction materials in Thessalonica and the second is a large newspaper in the city that is being produced by the workers themselves. We are in a time in which politics is not solely defined by ill defined actions, to be confused with any other type of action, and this because solidarity, democracy and co-responsibility are not only to be considered as ideological realities. After Syntagma, democracy and solidarity make up part of a daily struggle to redefine the meaning of what a dignified life is. Many of the people involved today were not involved before in politics, in the traditional sense, even if we understand also by politics an anti-hegemonic and anti-capitalist practice. This conception of politics which cuts across all of the levels of daily life is a re-definition of politics. In the kind of politics, people are invited consider the lives that they are leading and also to dream about what other kinds of life are possible. This new re-politicisation of the everyday produces a new kind of public space created by the making common-communalisation. This type of space is not one regulated by authority; it is not a space given under certain assumptions, conditions and rules. It is a type of public space that is produced through the people who are re-inventing the making of things in common. The public is not therefore what belongs to the State or to any other public institution, but a space that people produce in creating their very own lives and the goods that are necessary for them. This type of space (communal kitchens, medical social centres, educational social centres, culture …) is always a space that should remain open to negotiation; it is not a closed space. We should speak of it as a common space because it is no longer a public space as this latter is understood; These spaces have by necessity limits which are not closed, that are porous. It is a great lesson from Syntagma square that the public space is not that one which is open, but that one which is continuously open. This in opposition to the type of procedure according to which the police tried to limit the space of the square as an enclosed space of rebellion, similar also to the strategy of those who accused the occupied space of being asocial, an enclave of illegality (very much contrary to what was happening there) . 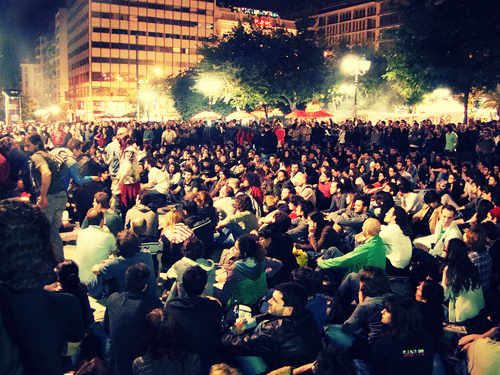 The lesson that Syntagma offers is whether this kind of space is the testing field for a new type of social life. These must be intermediary spaces, thresholds, that belong to no one and that belong to everyone. This is the legacy, a great quantity of experiences and initiatives that are being tried and that were unknown. It is not easy and it obliges us to go beyond ourselves on a few occasions. But it is important to be able to attain a better future of emancipation. A concern surrounding the commons follows from its definition as something which belongs to all and does not belong to anyone; something which leaves out the co-responsibility in the management of the commons. This is a characteristic of public space. Common spaces, like social centres, however, construct themselves around diverse, porous, inclusive communities, that open and close, but which are fundamental, because one cannot speak of a commons without a community. Perhaps the future of the commons will also involve recognising resources and communities beyond what is obvious, and the relation between them. In the definition of the public space as common, the idea that it can belong to all and to no one leave out the problem of communities. There are two general lines of thought in theories about the commons, one linking it to social emancipation, and the other sees it as a way to produce resources that can sustain a particular community. I believe that our response is to defend the commons as an option that defends communities always in process. Not stable communities, because communities which reproduce themselves are not necessarily engaged in a process of emancipation, but are rather immersed in a process of repetition that is essentially of a conservative nature. Through the process of making common and the constant re-negotiations, the communities re-define themselves by themselves and thereby emerge through a re-definition that would be emancipatory. There is an excellent video interview with Stavrides posted on the blog, The City at a Time of Crisis. This entry was posted in Commentary and tagged greece, revolution, Stavros Stavrides. Bookmark the permalink.